Although the S&P 500 Index has bounced significantly higher from the February lows, the market action seems indicative of one where investors were caught on the sidelines. Even with the move higher in stocks, individual investors are indicating their skepticism about the market advance if we look at AAII's bullish sentiment indicator. Today's release showed bullish investor sentiment was reported at 29.96%, a 7.4 percentage point decline from the prior week. 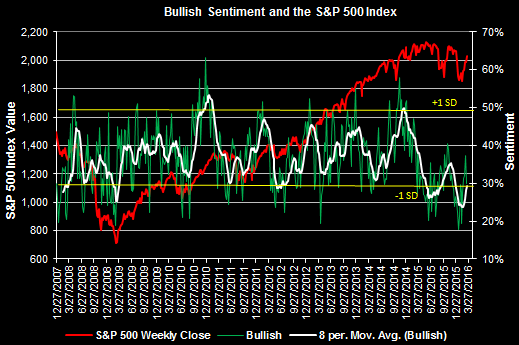 A majority of this point decline showed up in the neutral sentiment category. The net result is a nearly 10 percentage point decline in the bull/bear spread to 3.1%. With the strong move higher in stocks, as can be seen in the below chart, a number of technical indicators are indicating the market is at least short term over bought. The three technical indicators in the below chart, money flow index, MACD and stochastic indicator, are near or at overbought levels. 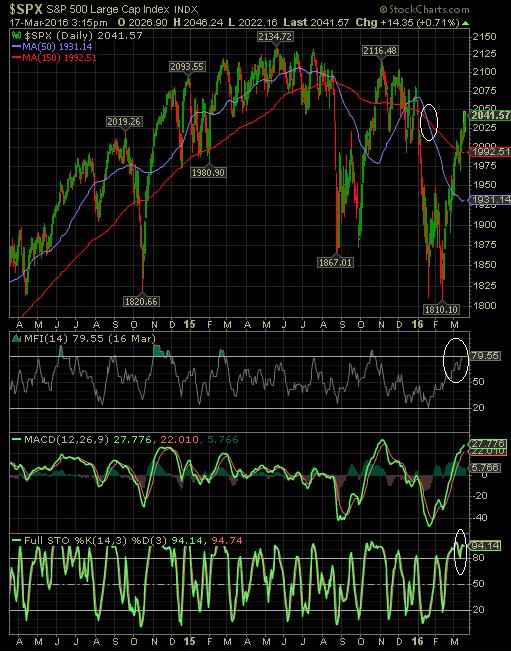 Interestingly, the death cross triggered in early January and it turned out to be a bullish trigger. Lastly, the two charts below show the percentage of S&P 500 stocks trading above their 50 day and 150 day moving averages. 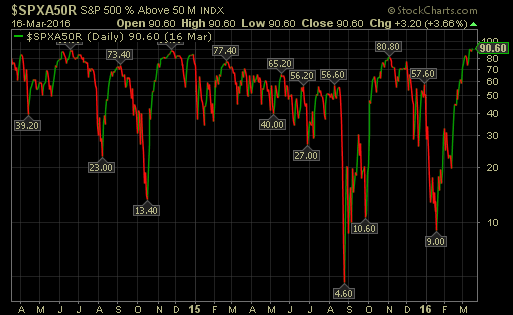 For the 50 day moving average chart, nearly 91% of S&P 500 stocks are above their 50 day M.A. This is far above the 9% reached in January. 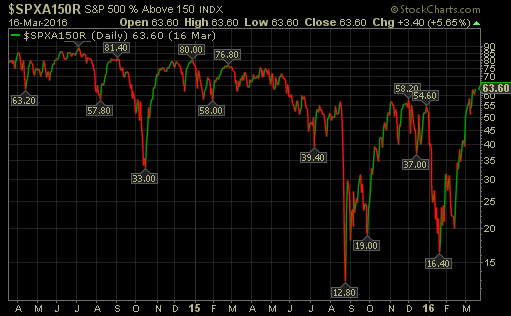 The second chart shows the percentage of S&P 500 stocks above their 150 day M.A. Although the level is higher than the early January percentage, it is not at the 80-81% level reached at a peak over the last several years. In summary, the S&P 500 Index has spiked higher by over10% since the February 11th low. Gains from here will not come easily and companies will need to deliver on earnings 'growth'. However, when pessimism reaches extremes, the market loves proving the consensus wrong. I little market consolidation after this kind of move would be healthy and not a surprise.